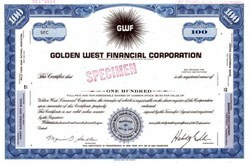 Beautifully engraved SCARCE SPECIMEN certificate from the Golden West Financial Corporation. This historic document was printed by the American Banknote Company in the 1960's and has an ornate border around it with a vignette of the company logo. This item has the printed signatures of the Company’s President and Secretary. World Savings, a federally chartered savings and lending institution, with over $59 billion in assets and Atlas companies, which manage and distribute its mutual funds and annuities.